In the toxic atmosphere of masculinist politics currently ailing India, the image of Rahul Gandhi hugging Narendra Modi reminded us that even the most bitter political confrontation can have scope for an unexpected manoeuvre. Note: This article was first published on July 21, 2018 and is being republished on February 11, 2019. When I heard of Rahul Gandhi’s hug, I did not, at first, feel good about it. Politics is not a Rajkumar Hirani film. Rahul is not Munnabhai. It was perhaps a wrong occasion to play such a role. But I realised it was also a brave and open political gesture. I believe in the politics of friendship, even though the antagonist may be a fierce opponent. Such a gesture can work in the theatre of democracy. In the toxic atmosphere of masculinist politics currently ailing India, it was rather interesting to witness a gesture that reminded us that even the most bitter political confrontation can have scope for an unexpected manoeuvre, where the body can cross the territory fixed by ideology. Rahul’s Gandhian politics of touchability may have played a masterstroke if it works: By hugging Modi, he broke the logic that equates ideological distance with physical distance. The gesture of physical proximity, overcoming the political barrier, is a unique one. It upsets the normalcy of ideological distance, and creates a tension that I can only call democratic. The politics of democracy is more game-like, where the figure of the enemy is restricted to political rivalry. In a democracy, the political rival is not, by general practice, banished from the territory of life. Rahul crossed the territory marked in parliament between the government and the opposition to make an exceptional gesture that symbolically meant territory can be crossed, maintaining the decorum of the house, if the intention and gesture dissolved the reason for that territory to exist in the first place: of animosity. He walked with decisive steps to make a point larger than political rivalry: of physical goodwill. No politician whose mind is ill with rivalry can make such a spontaneous gesture. Rahul made the point that he is not suffering from any hatred towards his political opponent, that he does not practice the politics of ill will. It reminded viewers, who welcomed his gesture on social media and elsewhere, that Indian politics was still capable of retaining democratic sobriety, in the middle of the most vicious ideological takeover of the polity. Most importantly, Rahul showed that he was capable of one thing currently difficult to maintain: sanity. Modi was visibly unsure about how to react to Rahul’s gesture. His pat on the back was woefully paternalistic, in comparison to Rahul’s gesture of camaraderie. The embrace reverberated with meanings that signified closer ties with India’s secular political culture. Rahul moved, while Modi was seated. Rahul bent, while Modi did not budge: It symbolised the gesture of movability versus the gesture of immovability, which can be extended to mean the difference between the politics of flexibility and the politics of inflexibility. Democracy demands flexibility. Rahul’s gesture in the central hall of democracy, watched by an immense audience, managed to tell the people that he was closer to the spirit of democracy than the prime minister. There is a time to gather stones, metaphorically, in the fated rivalries of politics. But to know when to cast away the stone and go for an embrace is something more subjectively determined. The decision to embrace is a decision that is opposite to and opposed to war. It is the decision to transform the idea of war into politics. Rahul, by his gesture, made the valuable point that he is doing pure politics, not war. Indian democracy breathed a sigh of relief at that gesture. 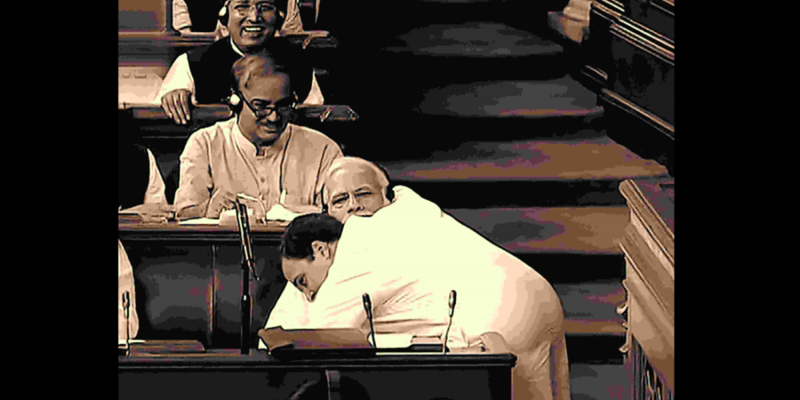 In the midst of a no-confidence motion, Rahul found the perfect moment to deliver an embrace. What he perhaps meant to say by that gesture was: he had no confidence in the government or the prime minister, but he had the heart to overcome and dissolve the toxic language of animosity. The gesture was imbued with a sensuous friendliness, making the rival feel at ease. It was meant to create a ground for dialogic nearness. Rahul’s famous hug, with its Gandhian roots, was aimed at mending the ties of the heart, at a crucial political moment in India’s political history, when we are witnessing a return to 1947. We can either further democracy or Partition. The choice is ours. 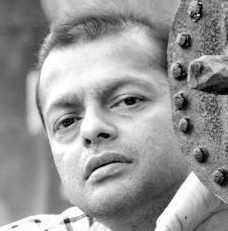 M​a​​nash Firaq Bhattacharjee is a poet, writer ​and political science scholar. His book Looking for the Nation (Speaking Tiger Books, 2018) is forthcoming.